An important part of the genealogy of Mexican muralism, the first twentieth- century art movement of the Americas, goes back to the experiences of Mexican artists in that century’s early decades. 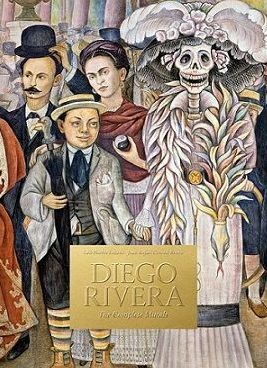 Of these artists Diego Rivera was and remains the most important but, before the publication of a new art book highlighting his achievement, his astonishing work has been under the radar. Rivera and other artists were able to travel abroad as a result of grants from the Mexican government. Paris became the city of choice and, after a short stay in Madrid, it became Rivera’s base before he returned to Mexico in 1920, some thirteen years. When he returned, Cubism and European modernism had indelibly influenced him but Rivera was also influenced by Mexico’s pre-Colombian culture. The result is hybrid and, given his intoxicating use of colour and human figures, hypnotic. Imagine Renaissance paintings imbued with a proletarian consciousness. 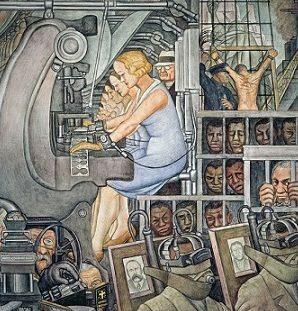 Rivera received commissions for work in North America and he considered his best work undertaken there to be the murals he painted at the Detroit Institute of Art in Michigan in 1932. The commission was surprising because Rivera never disguised his left-wing politics; he was a communist despite being expelled from the American Communist Party in 1929. Corporate America only became alarmed when a figure unmistakably resembling Lenin was recognised in work he was executing in the lobby of a building he was painting in the Rockefeller Center in New York.He was willing to compromise but not to remove it altogether. In May 1933 he was called down from the scaffolding while completing this work and refused re-entry. Check out “Man at the crossroads” in Wikipedia for the story. The money Rivera had already nreceived for his Rockefeller project was used to paint Portrait of America for the New Workers’ School, the headquarters of the CPO, the Communist Party (Opposition) in New York. His friend Bertram Wolfe, who had also been expelled from the American Communist Party, had founded the CPO. 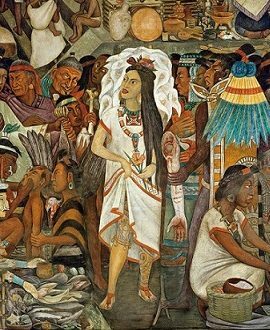 Costing £39, “Diego Rivera: complete murals” is not an inexpensive book to buy – nor is it small in size (29cm by 44cm) – but such is the quality and quantity of the colour reproductions spread over its 674 pages that the price is worth paying for an exceptional publication. As well as large-scale images of his work in double fold-outs, there are other illustrations that zoom in on details of particular murals. Taken together, the result is astounding, a page-turner. The book’s text is exemplary in the way it sticks to empirical information and authoritative commentary rather than indulging in post-modernist twaddle about art and aesthetics. As a result of gazing in wonder at the images of the murals and taking note of the cities where his work can be seen – principally Mexico City, Cuernavaca and Chapingo – you will want to plan a trip to Mexico just to see the murals in all their mesmerizing glory.